What Do New Puppy Owners Need? Fewer puddles on the carpet? A refresher course in being patient? How? By making sure you have access to all the information and advice you need to keep your precious new puppy healthy and happy - and give him the best possible chance of living a long and active life. If you’re a brand new puppy owner (or it’s been a while since you had a puppy in the house), you might be feeling just a little anxious about caring for your new family member right about now. Could you use some help and advice on creating a safe home environment for your new puppy? Are you feeling bewildered by the thought of dealing with vet visits, vaccinations and other puppy health care responsibilities? Do you worry that you might not recognize the signs and symptoms of common dog illnesses that could threaten your new pup's health? Perhaps you just feel like you're in over your head and could do with a little help? 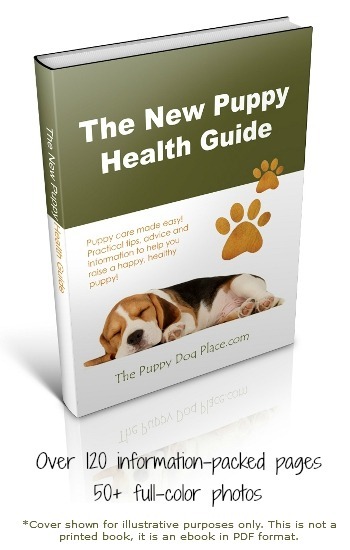 My New Puppy Health Guide is just what you need! Owner of this website, a life-long dog lover, and currently the proud owner of a whole pack of funny, beautiful, spirited and loving dogs. Over the years, I've learned that as a puppy owner, you need to be aware of safety issues such as how to puppy-proof your home and what everyday foods and household items can be toxic, even deadly to your new pup. 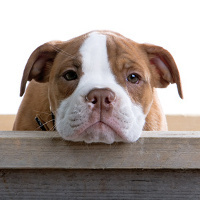 You also need to know about the most common illnesses that affect puppies, and how to plan for preventative veterinary care such as vaccinations and parasite control. If you're not informed, you leave your puppy vulnerable to all sorts of suffering and sickness – not to mention some hefty vet bills. Luckily, it's pretty easy to learn lots of stuff about how to care of that little furball online, or at the library, or even on YouTube - but when it comes to health-care you need to have practical, up to date information right at hand, right when you need it. And that's where my e-book comes in. Taking care of a new puppy properly isn’t rocket science, but it can be challenging for new owners because there’s simply so much to learn... and it’s ‘on-the-job’ training when everything you do counts – right here, right now! Your puppy needs lots of things from you, but in my experience proper veterinary healthcare is the cornerstone that his future is built on, and it’s hands-down the most important thing you can give him. Of course, that little furball needs to be housebroken, trained, socialized and more... but your first priority has to be making sure that he has the safe home environment, nutrition, and routine veterinary care he needs to stay healthy. 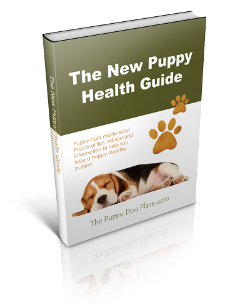 My New Puppy Health Guide is a complete, step-by-step walkthrough that covers literally every aspect of new puppy health care. I’ve gathered together everything I’ve learned over decades of hands on dog-ownership, and many years of helping other dog owners and lovers care for their pets through this website - and poured it all into this comprehensive book. While a lot of the information in this book can be found throughout my website, this guide makes it a snap to find exactly what you need - right when you need it! PLUS I've updated and extended many of the topics, and there's a whole brand-new section on puppy-proofing your home which is not available on this website. Because your puppy's health is precious, you don't want to waste any time getting your hands on the advice you need quickly. My ebook is the perfect answer because your downloaded copy will be right there on your home PC or laptop, whenever you need it. You can even print it yourself at home if you prefer and keep that close at hand too. Written in a simple, easy-to-read style my New Puppy Health Guide is loaded with tried-and-tested tips, practical advice and up-to-date information that you can start using today. It will put all your puppy-health-care worries to rest – for good! You want to know what you're paying for right? I don't blame you. Some e-books are thin on content and padded out with large text and big white spaces. You won't find any of that in my New Puppy Health Guide. With over 120 pages packed full of comprehensive information and advice covering everything you need to know about puppy health care, and 50+ beautiful full-color images, this is a guide that you'll enjoy reading and I'm absolutely sure you'll agree that it's worth every penny. All puppies are adorable, and the importance of choosing a healthy puppy is sometimes overlooked in the excitement of picking out your new family member. Learn how to avoid this potentially costly mistake and what to look for in a healthy pup. Understanding normal puppy development and what 'phases and stages' your puppy is going to go through is hugely important. By learning what to expect in terms of puppy growth and development you can avoid confusion, and both your and your pup will be happier. Puppies have a knack of getting into trouble - and sometimes I think their adorable cuteness is Nature's way of making sure they're forgiven! But now and then their antics can have disastrous consequences. Find out how to keep your puppy safe by avoiding some surprising and unexpected dangers. Making sure your pup has been vaccinated properly is one of the most important ways you can protect his health. Regulations, recommendations and professional opinions can be varied and confusing, but everything you need to know is right here. These nasty little parasites can make your puppy absolutely miserable, and can cause serious health problems if left untreated. Find out how to prevent and deal with a worm infestation... including the deadly heartworm. Making sure that your puppy gets the right balance of nutrients is very important for his health, both now and in the future. With so many puppy food choices out there, it can be tricky to know which one is the best choice for your puppy. All the answers you need are in this chapter. Young puppies are vulnerable to a LOT of different diseases and conditions. It's vital to know how to prevent, treat and diagnose these dangerous illnesses so that your little one has the best chance possible of living a long, happy and healthy life. This is a very common puppy complaint, and can be caused by something simple - or serious. Your puppy's life could depend on you being able to tell which one is causing his loose stools. Get the tips and advice you need to make that call. Another common puppy complaint that could be a minor worry or the sign of something much worse. Understanding why your puppy is throwing up, and knowing when to get help is absolutely essential. Puppies are endlessly curious and many die every year as a direct result of ingesting something toxic. Learn how to protect your puppy, and what to do in an emergency in this chapter. Allergies can make your puppy absolutely miserable. A severe allergic reaction can be life-threatening. Find out what triggers allergies plus how to recognize and treat them right here. Find some of the best all-natural remedies for a whole host of puppy health problems in this chapter. Some can be used as an alternative to more mainstream medications, others work well when used in conjuction with traditional treatments. What you need to know is here. I'm 100% positive that my New Puppy Health Guide is going to help you create a healthier, safer environment for your pup and give you the best possible opportunity to raise a happy, healthy pet (and probably save you money on vet bills in the process). That's why I offer a complete, no-questions-asked money back guarantee. I know the tips and advice in this guide works - because I've used it all myself over and over again, with many different dogs. I’m also confident that it will help you take better care of your new puppy, and give you some much-needed peace of mind during those happy, busy, but often confusing, days of puppyhood. If at any time in the next 30 days you don't feel 100% satisfied with your purchase, you can claim a full refund. Ready To Learn How To Keep Your Puppy Safe & Healthy? Then Order Now! You get what you paid for immediately.... no shipping costs and no waiting. The ebook is in PDF format and after ordering you will be taken to a download page where you get instant access to download the ebook to your computer. 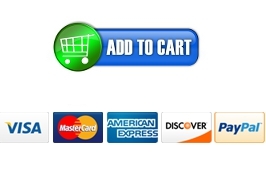 You will also receive an email with the download link. If you're not completely satisfied, you get a refund – no questions asked! If you have any questions, or problems with your download please go to my Contact Page and let me know. I'll do everything I can to help. I'd also love to hear your feedback! Please use the same contact page to send me your testimonials and stories of how you used the information in my ebook to keep your puppy happy and healthy. Comments or suggestions are also very welcome, I'd love to share them with other visitors to my site. If you have any criticisms, feel free to share those too. I want to make sure that my New Puppy Health Guide is the very best it can be, and that it lives up to your expectations. Thanks for visiting and best of luck on your new puppy parenting adventure!